After the long winter, you are surprised how quickly it passed. The days are getting longer. Filled with new energy, you can hardly wait to see how everything comes back to life. A colorful season. Although it has cooled off a bit, the seaside is just as appealing, as it was in summer. There are still plenty of things you can do outside - so, let's get to it! Everything is covered by snow and glittering frost. The flies are long gone. It is the last season of the year, and absolutely beautiful. Everything is green and blooming. The weather is pleasant, even if it is raining. Do you want to try something new this summer? Or are you just excited to get back to what you love doing? 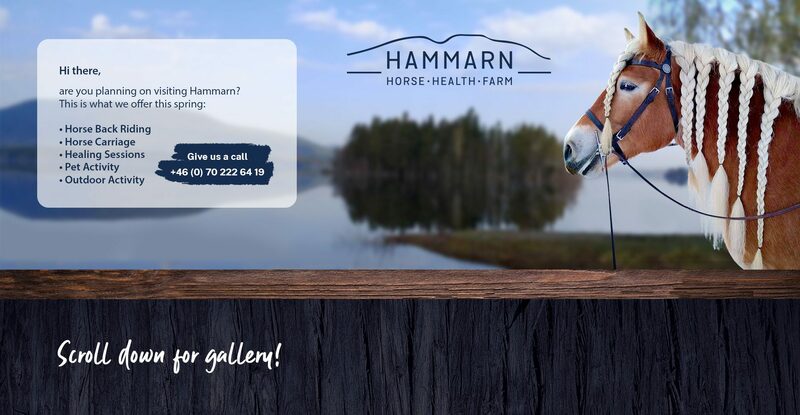 The farm Hammarn is located in the village of Svedje. The village already existed in the 16th century and the farm was mentioned for the first time in 1786. From the farm, the woodland lake of Svedje and "Älvåsen" are seen in the background. There is a mountain farm belonging to the farm, Svedjebovallen. It is located in northeast Hassela and was founded in the early 19th century. We have organic production and hold Sweden's northernmost gene bank for Roslag sheep. It is a breed of endangered domesticated sheep that originated in and is almost exclusively found in Sweden. At the farm we breed and train North Swedish draft horses and hold different courses in driving. We offer visits, courses and overnight stays at the mountain farm. Adjacent to the mountain farm is the "Svedjebovall" Nature Reserve with its coarse-grown old forests and species that are unusual in today's forest landscape. With us you can join in on an adventure and get an experience for life. Here you can meet the animals, enjoy the silent nature, go for a horse back ride or for a ride with the horse carriage. Welcome July 9 to October 28!